Rats and mice can cause a whole range of problems including introducing disease and parasites to your home, structural damage and food spoilage on a massive scale. While evicting an established infestation can be a major problem for the householder, a number of simple steps can help prevent things getting out of hand. There are two kinds of rat in Britain, the Black or Ship rat (Rattus rattus) and the Brown rat (Rattus norvegicus). Just to confuse things, while Brown rats are almost never black, the Black rat can often be a shade of brown – so colour is not diagnostic! The Brown rat is by far the most common, living in a wide range urban and rural settings. The Black rat, which once had the run of the country before its brown cousin arrived, is nowadays largely confined to ports and docks. Adults of both kinds are usually between 30 – 45 cm long, nose to tail, the Brown rat being the stockier of the two. The House mouse is a much smaller animal, 7 – 10 cm long, with proportionally larger ears and smaller eyes. All are prolific breeders. The House mouse and the Brown rat are sexually mature at two months, the Black rat joining the mating game at four months of age; all can produce six litters a year – containing eight or more young. Given a ready source of food, a single pair can become an invading army very quickly! Mice will often set up their nests within the home, though they do spend some parts of the year out of doors; rats by contrast only tend to visit our houses on foraging expeditions, living in outside burrows, often beneath sheds or paving slabs. Both are principally noctural, so the numbers can build up unnoticed and while mice are sometimes to be seen during the daytime, spotting a rat before dark usually indicates that the colony is getting very large. Apart from the food they consume, these rodents cause widespread contamination with their urine and droppings – often spoiling ten times as much as they actually eat. Rats in particular can carry an extraordinary array of diseases and it has been estimated that something in the region of one in three carry the potentially fatal Weil’s Disease (leptospirosis). In addition, both rats and mice can cause extensive structural damage to the home, gnawing through an amazing range of materials, with electrical wiring, for reasons known only to a rat, featuring high on the list. 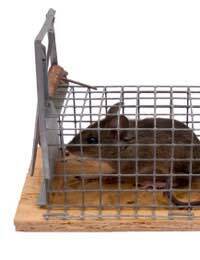 The easiest way of dealing with rodents is to make sure that they do not get a toe-hold in the first place. They are omnivorous and will feed on a wide range of foods, depending on what is available. Any meal for you or your pet will do very nicely for a rat or mouse too, so to avoid extending an open invitation, food stores must be secure, any spillages cleaned up quickly and kitchen waste stored properly. The need for a good standard of hygiene also extends to the outside of a property too – food scraps on compost heaps, undisturbed sheds and general debris around the garden can all attract rats and mice. To prevent rodents entering the house, block up any gaps in the masonry, cupboards or around pipes and make sure windows and doors fit correctly. Attaching suitable guards to the drainpipes will stop rats climbing up them. Some people have had success deterring these pests with fresh mint and a range of ultrasonic devices are also available which are said to be effective. It may be possible to deal with a small number of mice or rats by trapping, but for a larger infestation, the only really effective method is likely to be poison and a variety of suitable products are on sale. Mice are inquisitive and will try new food sources, so a large number of small bait stations will get their interest; rats on the other hand are wary creatures, prone to giving any new thing a wide berth. Only once they have become accustomed to its presence, will rats begin to take the bait. It is important to be aware, however, that rodent poisons – rodenticides – can represent a major danger to cats and dogs, which may either eat the bait itself or one of the pests which has taken it. Pets must be kept well away from both treated areas and the dead or dying rodents – as should children, too, of course. While the householder may be able to deal with these pests on a small scale, a major rodent infestation is probably best left to the experts – though as always, taking steps to avoid the problem in the first place is by far the best option.